On the edge of a pittoresque, typically Dutch landscape, this small house, perched on a dyke, has recently been entirely renovated. From the large terrace of the enclosed garden, there is a lovely view of the Tragel, a historical waterway. The wide, sandy beaches are only 4 kms away, and for all necessary shopping, the town of Oostburg is just a short drive. The house is full of atmosphere, nicely decorated, with a well-equipped kitchen and a luxurious bathroom with shower and bathtub. 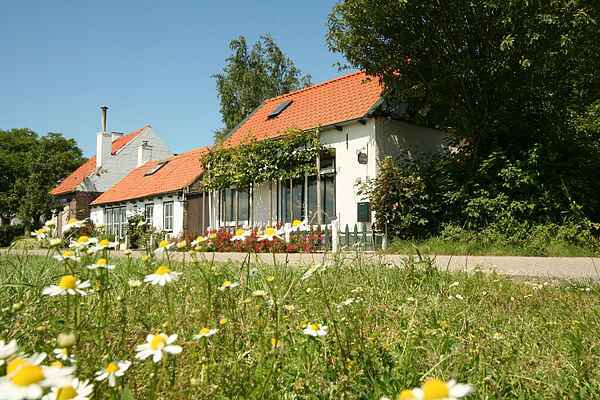 A bicycle-path passes by the house, taking you along the calm country roads, to end at the 'bike-ferry' over the Westerschelde which goes to Vlissingen. Zeeland is a paradise for cyclists: you can enjoy more than a thousand kilometers of marked, border-crossing bicycle trails! The surroundings are full of possibilities: the historical cities of Bruges and Gand are just a short drive away, the sea-resorts of Knokke-Le Zoute and Cadzand are really fun, and the historical, fortified town of Sluis is certainly worth a visit.